Social media has been a platform that has done a lot to propel mixed martial arts forward into the mainstream psyche over the past decade. The sport was built around the Internet, with file sharers and tape traders working together on forums to share their love of MMA. It only made sense that these same people would take to social media to continue their undying support for a phenomenon that continues to become one of the most intriguing new sports to pierce popular culture in some time. But for all social media has done to help the sport, it also serves as its biggest critic. When a fight card is perceived as good or of a high quality, fans and media will rally to help the card do well. When a fight card is perceived as poor or of a low quality, they’ll tear it down. Unfortunately, the latter has taken place with UFC 177. For what UFC 177 lacks in star power, it makes up for in competitive bouts. From top to bottom, the card is filled with intriguing bouts that have presented odds makers with more than a few headaches over the last few months. Up until Friday, hours before the weigh-ins were scheduled to take place, the main event was supposed to be a rematch for the bantamweight championship between T.J. Dillashaw and former champion Renan Barao. Due to medical reasons, suspected to have to do with weight cutting, Barao is out and undercard fighter Joe Soto is stepping in on one days notice. If there’s ever been a true underdog story in UFC history, this is it. A former champion in Bellator and Tachi Palace Fighting, Soto has been fighting since 2006. He was scheduled to make his UFC debut on the undercard of UFC 177 against Anthony Birchak. Instead, he’ll be in what is unquestionably the biggest bout of his career as he steps in against Dillashaw. Soto has knockout power and a proven track record of tricky submission victories. His most prominent wins have come against WEC veteran Chad George and current UFC flyweight standout Wilson Reis. In his most recent bout, he defeated highly touted prospect Terrior Ware. With six wins in a row, the last one coming earlier in August, Soto should have confidence heading into this bout. This isn’t the fight expected or asked for, but it’s the fight we’re getting. Every champion gets curveballs thrown their way, the great ones find a way to hit it out of the park. 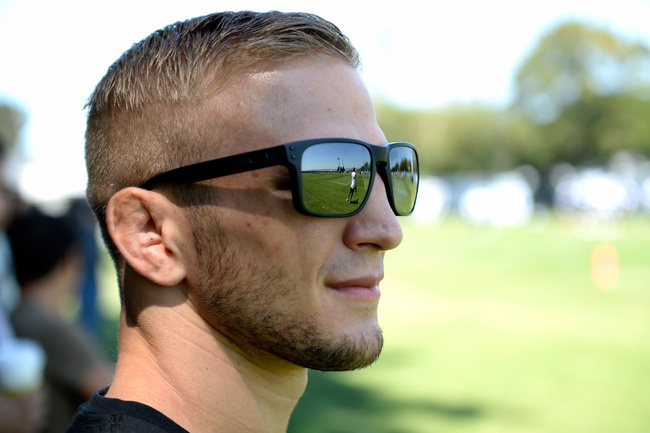 There’s no mistaking that Dillashaw enters the cage a heavy favorite. This is Soto’s Hail Mary attempt at becoming a star. The co-main event features two fighters who are looking to make their presence known in the UFC’s loaded lightweight division. The rankings see both men on the outside looking in of the top 15, but with recent losses from 15th ranked Gray Maynard and 12th ranked Rustam Khabilov, there’s room for movement. A team Alpha Male veteran, 35 year old Danny Castillo needs a win here in the most high profile fight of his career. Having won three of his last four bouts, Castillo is on one of the bigger highs of his career. Aging fast, it’s now or never. Tony Ferguson is 5-1 inside the Octagon and a win over Castillo will almost certainly propel him into the top 15. The well-rounded striker has found a way to finish in four of his five UFC victories, making him a favorite among fans. Castillo will need to use his wrestling and avoid the big punches from Ferguson to have any chance at walking away with the important win. There’s been a serious lack of female fights on UFC pay-per-views of late. Thanks to Shayna Baszler and Bethe Correia, that’s about the come to an end. The undefeated Correia is coming off of wins over Julie Kedzie and Baszler teammate Jessamyn Duke in her last two outings and is quickly becoming a fighter to watch in the women’s bantamweight division. Her exciting striking style has garnered her plenty of fans and she is likely only a few wins out from a shot at the division’s queen bee, Ronda Rousey. Baszler is a pioneer of female mixed martial arts. Despite having lost two of her last three bouts, she’s as dangerous as any fighter in the division. She’s amongst the best submissions artists competing in women’s MMA and can lock on to a limb at any time. It’s one of the more interesting style matchups on the card, and should provide plenty of entertainment whether the fight stays on the feet or goes to the ground. At 10-0 as a professional (1-0 in the UFC), Carlos Diego Ferreira is one of the most compelling prospects to come out of the Legacy Fighting Championships promotion. A submission fighter, Ferreira has worked hard to become a well-rounded fighter. His 38 second rear-naked choke of Colton Smith in June put him on the map, and a win over Ramsey Nijem will cement his spot as a fighter to watch. Ramsey Nijem has put together back-to-back wins for the second time in his UFC career and will be looking to make it three in a row against Ferreira. Unfortunately, Nijem has proven susceptible to submissions in his career and if he hasn’t addressed the problem could be going to sleep again. It’s been a rough go of things for Yancy Medeiros as of late, having gone 0-2-1 inside the Octagon. The Hawaiian will be looking to notch his first UFC victory as he takes on debuting Damon Jackson in the main card’s opening bout. A knockout artist, Medeiros will be looking to keep the fight stranding and use his length to pick apart his opponent. Jackson is an incredible submission artist who got the attention of fight fans internationally with his submission of fan favorite Leonard Garcia in July. It’s too early to tell, but Jackson looks to be the kind of fighter with a high upside and a load of potential. At only 26, his best years as a fighter are still in front of him, which isn’t what Medeiros and the rest of the featherweight division want to hear. There’s no Cain Velasquez, Jon Jones or Anderson Silva on this card, but if the fights deliver as they should, it could still very well be an intriguing, and action-filled night at UFC 177.